Visitors from a botanical society in Nantes, France, joined the FoPP for a full day, on 4th July 2015. They looked at, photographed and made detail records of the plants they found at Pickerings Pasture, in the morning. After a home cooked meal, at lunch time, provided by the FoPP Chairperson, in the Visitors Centre, they were taken on a guided walk to Hale Duck Decoy NR. They were most appreciative of the day we were able to arranged for them, especially as one of our members is a retired language teacher and was able to act as an excellent interpreter. Other volunteer members of our group helped to make this a special and memorable day. They don't have a culture of volunteer groups, like ourselves, in France. 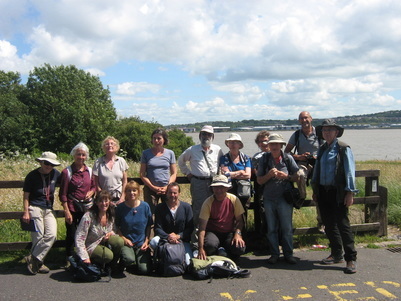 The visitors had spent the last week visiting sites on the Wirral and in the Southport area, travelling on public transport, looking for botanical specimens.